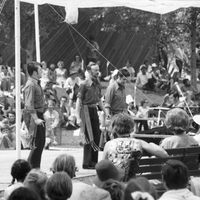 Image of three men (of Ensemble Folklorique Kebec) step dancing before a large outdoor audience. 1 neg (#18) scanned out of 135 in assignment. Betts, “Rock Festival - Mariposa,” York University Libraries | Clara Thomas Archives & Special Collections online exhibits, accessed April 23, 2019, http://archives.library.yorku.ca/items/show/1517.